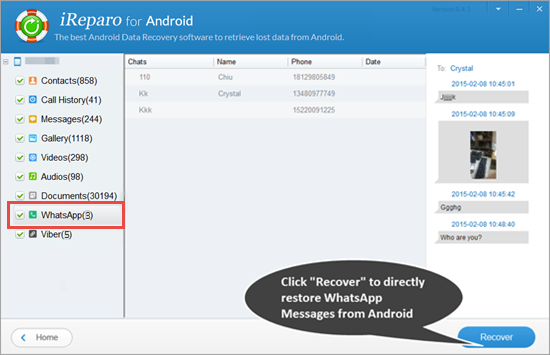 The most convenient and reliable way to recover WhatsApp chat history from android devices is using Jihosoft Android Data Recovery program. 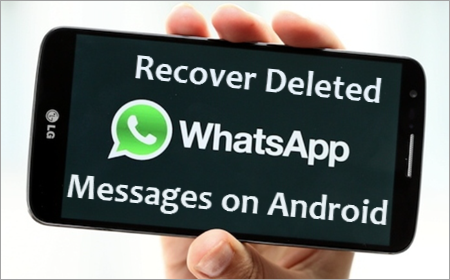 With this android WhatsApp recovery tool, you can recover the older WhatsApp chats without losing the current messages. Besides, it allows you directly recover WhatsApp messages and photos from Android device without any backups with ease. Download and install free trail version of Jihosoft Android Data Recovery. Connect Android device to computer with USB cable. Set up Android device to enable USB debugging. Run Android Data Recovery program. It will automatically detect your Android device. Simply click “Start” to scan WhatsApp messages. Preview and restore deleted WhatsApp chat history. After scan completes, choose “WhatsApp Messages” and tap “Recover”. Note: Don’t use your Android device after you lost WhatsApp messages, as the deleted chat history will probably be overwritten by any new content added later. WhatsApp automatically backs up chat history every day at 4 am system time. Its WhatsApp backup folder can be stored for up to 7 days. It is surprisingly simple to restore WhatsApp chat history that less than seven days old by uninstalling and reinstalling WhatsApp. Backup your current WhatsApp chat history. Any new messages sent/received after a backup, and deleted before the next backup, cannot be restored. Uninstall WhatsApp. Navigate to Settings > Applications > WhatsApp > Uninstall. Then reboot Android device. Reinstall WhatsApp. Open WhatsApp and continue to the next screen step by step. Then verify your phone number. Restore WhatsApp messages. Hit the “Restore” button when prompted. WhatsApp chats older than seven days are slightly more difficult to restore. where “YYYY-MM-DD” is the year, month and date respectively. Rename “msgstore.db.crypt”, adding “OLD” or something similar to the file name. Find file from before you accidentally lost everything and rename it “msgstore.db.crypt”. Back to your android device, then uninstall and reinstall WhatsApp in the same way as the above method. Note: Restoring older WhatsApp chat in this way will erase current messages.